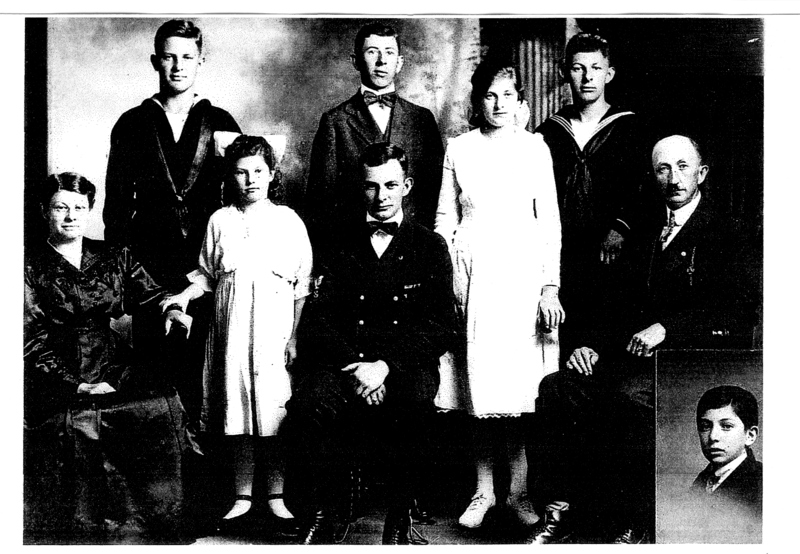 It was my pleasure to recently receive from Mr. Jack Schonely the attached picture of the family of Henry B. Schonely. Henry B. and his wife Ada were Jack’s grandparents. In the picture we see seated in the foreground (left to right) Ada C. (nee Weidner), Getrude, Walter, Helen and Henry B. … Arthur in the insert. Standing we find Elwood, Harvey and Rufus. Three of the Schonely sons were in the Navy. Elwood and Rufus served on the battleship USS Nevada and Walter on the USS Pennsylvania. Both these battleships were at Pearl Harbor when the Japanese attacked and both survived the bombing. Henry was the son of George F. Schoenly and Lucy Bauman, born in 1873. According to the US Census 1880 the family spelled the name as Schoenly but by the 1900 census Schanely was used. Then by 1910 the Schonely variation had been settled upon. By 1920 Henry B Schonely owned his own barber shop in Oley, PA and continue in that profession the remainder of his life. In the early 1960s he was still working as a barber and had a column written about him in the Pottown Mercury as the oldest barber in Pottstown. Henry died in 1964 over 90 years of age. For some reason the picture is no longer being displayed. However, if you click on the frame where the picture should be it will open for viewing.